There are two guest chefs on the roster for this year’s Twelve Days of Christmas at The Restaurant at Meadowood whose restaurants I have not visited. 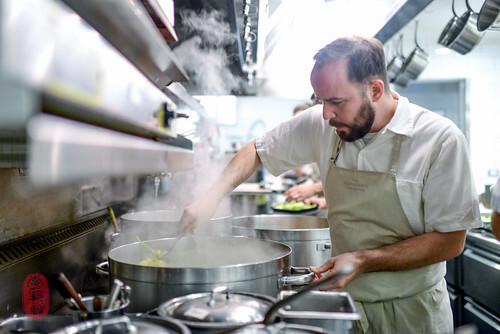 One of them is Joshua McFadden, chef of Ava Gene’s, a “Roman”-style Italian restaurant in Portland, Oregon. I first met McFadden at The Restaurant at Meadowood last year when he and the owner of Ava Gene’s, Duane Sorenson*, attended the Twelve Days of Christmas. 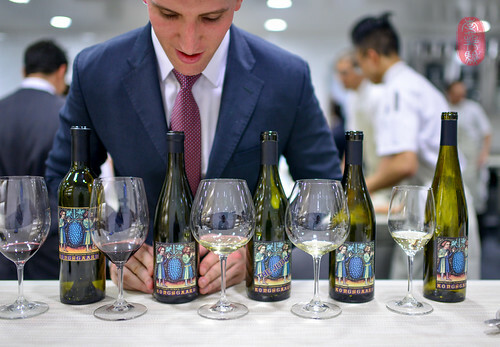 This year, chef Christopher Kostow invited him back as the guest chef for the sixth night of this dinner series, with wine pairings by Kongsgaard. Of all of the Twelve Days of Christmas dinners I’ve attended so far, McFadden’s was one of the most collaborative. There were only five courses, and for four of them, it was call-and-echo, with McFadden presenting a dish, and Kostow answering with a counterpart. And everything was served family-style. The first course, which McFadden presented alone, was focused on bread and its condiments. He served warm Tartine Bakery sesame bread with some Katz extra virgin olive oil, butter that McFadden brought from Portland, a spread made from Borlotti beans from Ayres Farm (one of McFadden’s purveyors in Oregon), and a bright, colorful citrus salad that included super-crunchy celtuce that had been crisped in ice water. For the second course, each chef presented a cold salad, and for the third course, they both served pasta. The highlight of this dinner for me was the fourth course. 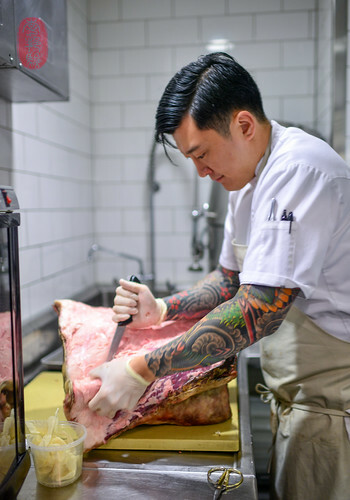 Chef Kostow and his team cooked a gorgeous côte de boeuf that had been aged about two months by Bryan Flannery. 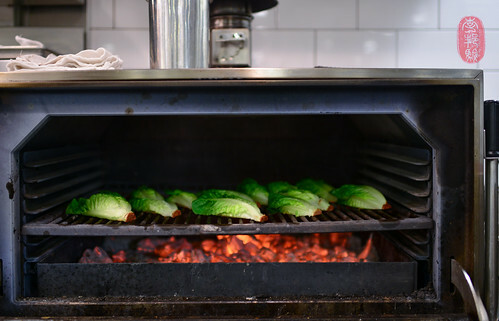 The ribs were removed, cut into individual portions, cooked confit in its own tallow, and then crisped on the open-flame grill. The rest of the beef was broken down – the cap removed, and the ribeye cut into smaller portions. The meat was cooked confit in its own tallow, sliced, and dressed with a bit of the melted fat and some of its natural juices. Each guest was served a piece of the rib, along with slices from the ribeye. I was served a few strips of the meat from the cap – my favorite cut. I rarely gush about food. But this was fantastic: simple, delicious, perfect. The beef was served with three side dishes. There were matsutake and potatoes à la grecque, and a “pesto” made from “trimmings” from The Restaurant at Meadwood’s garden. ** Joshua McFadden served creamy polenta. Similar to the Franks, who based their menu on the traditional, Italian Christmastime “Feast of Seven Fishes,” McFadden ended his dinner with a “flood of sweets.” On that carousel of mini desserts, McFadden served silky vanilla panna cotta and crispy cannoli shells filled with whipped ricotta and rolled in chopped pistachios. The pastry team at The Restaurant at Meadowood added a number of its own mignardises, including a toasty tuile made of brown butter and coffee garnished with walnut purée and candied black walnuts. Below, you’ll find the menu from the sixth night of the Twelve Days of Christmas featuring Joshua McFadden of Ava Gene’s and wines by Kongsgaard (I’m obsessed with Kongsgaard’s medieval-looking label). Following the menu, you’ll find a slideshow of all of the photos that I took. Lamb ragu, greens, Grove 45 XVOO. Polenta, and “pesto” of garden trimmings. * In addition to owning two restaurants, one of which is Ava Gene’s, Duane Sorenson also owns Stumptown Coffee. Sorenson named Ava Gene’s after his daughter. ** Since this “pesto” contained neither cheese nor nuts, I debated with some of the cooks as to whether this rough purée of vegetable trimmings with oil was more of a “chimichurri” than “pesto.” But, they noted that this “pesto” didn’t contain garlic or vinegar, so “chimichurri” wouldn’t be an accurate label either. ~ by ulterior epicure on December 16, 2014.